We love a good horror movie, but when horror movie happenings occur IRL, we’re not so cool with it. 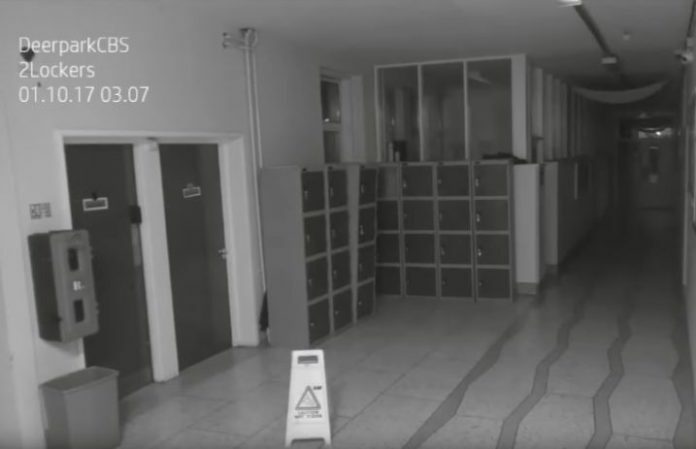 A school on the south side of the city of Cork in Ireland has uploaded terrifying footage of what is apparently (and maybe definitely…) a ghost slamming doors, knocking over lockers and demolishing a wet floor sign. We’ll be honest here: This footage is definitely not for the faint of heart. Or at least those folks who don’t like horror movies. The recording was taken at the most haunted time—a convenient 3:00 a.m. on Oct. 1. Some might say it’s a prank, but the principal is claiming that the video is completely real. “If it’s a prank we don’t know how it was done. Motion sensors were set off at this time, that’s how it was caught,” principal Aaron Wolfe told UNILAD. “Our caretaker has worked in the school for over 30 years he recalls many stories of ‘paranormal activity’,” Wolfe says. And with that, we know that we are definitely not stepping foot in the Deerpark school in Cork. What are your thoughts: Prank or poltergeist? Sound off in the comments below!